As of Wednesday, August 1st, Hubspot’s blog tool will no longer support the ability for visiting commenters to subscribe to follow up comments. This functionality currently lives as a form field on blog comment forms, where commenters can opt to receive email notifications when another visitor comments on the same blog post. 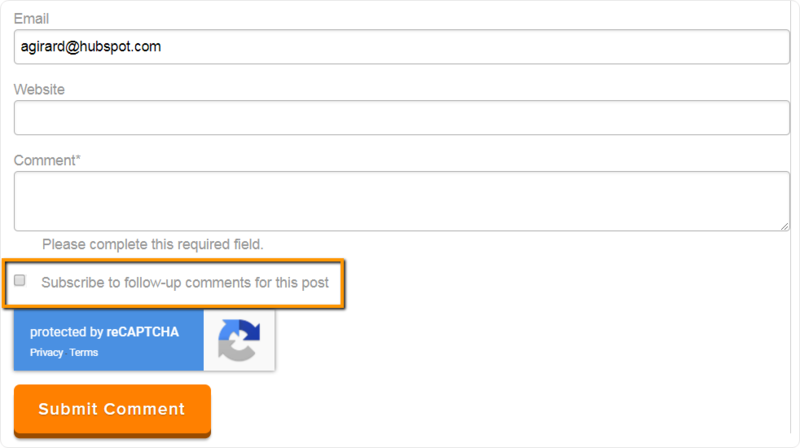 New blog comment forms will no longer have this field in the blog comment form editor, and the field will not render on live blog comment forms. For commenters who have subscribed to existing posts, they will continue to receive blog comment notification emails for the posts they are already subscribed to until Tuesday, September 4th. This update does not affect HubSpot User blog comment notifications. Why remove blog comment subscription emails? With the introduction of the General Data Protection Regulation (GDPR), HubSpot has made many changes to help our customers align their marketing efforts with the new regulations. With the current implementation of blog comment subscriptions, we feel this feature is not up to par with our GDPR standards and are therefore sunsetting this feature.